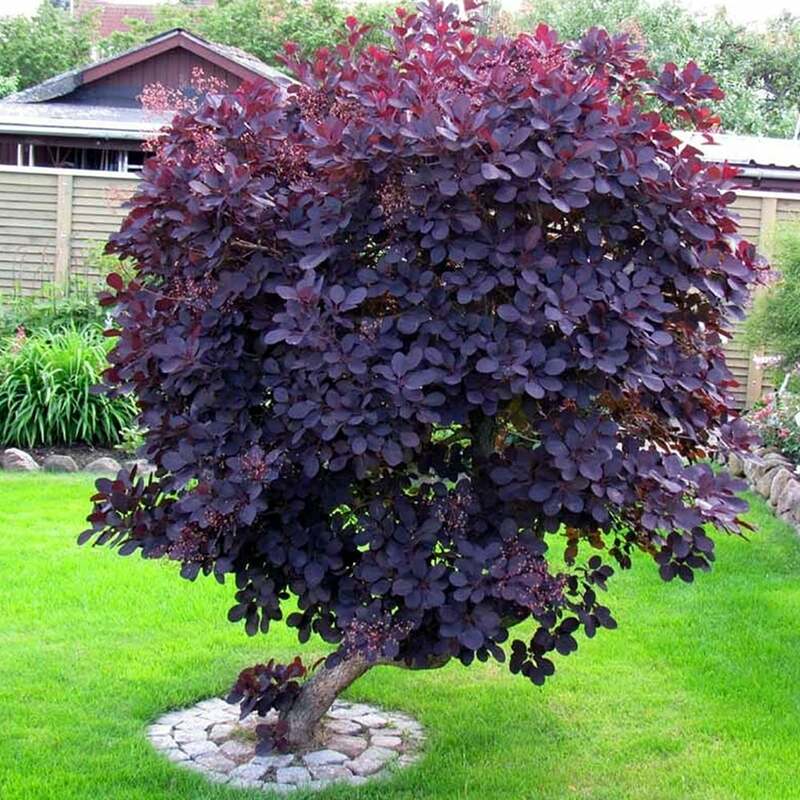 Cotinus Coggygria 'Royal Purple' or commonly known as Smoke Bush, is a compact small tree with distinct attractive purple foliage. This upright deciduous multi-stemmed shrub can be used as a single small tree specimen in any cottage garden. Smoke Bush (or Smoke Tree) features dramatic ovate dark reddish-purple leaves, that turn deep scarlet in autumn. These long-lasting leaves appear translucent when backlit by sun. In spring, you will notice tiny but insignificant yellow flowers in terminal panicles. Small hairs attached to these clusters turn smoky purplish pink, covering the plant with hazy, smoke-like puffs throughout summer. Royal Purple Smoke Bushes will thrive in moderately fertile and moist soil that is well-drained. These are tolerant of alkaline, clay or dry soil, in fact they will become drought tolerant as they mature. They will grow in partial shade, but you don’t want to miss the striking hazy, translucent display of foliage in full sun. Smoke Bushes need average water for propagation in the early growing seasons. Minimal pruning is required to maintain a healthy mount. Cotinus Smoke trees are excellent single garden specimen, or planted in a shrub border. They make great selection for hedges. Plant them in sunny spots in your garden, where the smoky foliage display will be significant and dazzling.